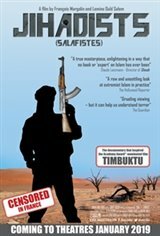 A pair of Western filmmakers were granted unparalleled access to fundamentalist clerics of Sunni Islam who proselytize for a purer form of Islam--including jihad of the sword--in Mali, Tunisia, Iraq and Afghanistan. Their theoretical interpretations are juxtaposed against images and footage from recruitment videos to show the hardline application of sharia law. Without experts contextualizing these events, the film, which inspired the Oscar-nominated feature, Timbuktu, paints a stark portrait of everyday life under jihadi rule.